You can create a route with the route planner in Suunto Movescount or export the track of a recorded activity to the planner. Go to Suunto Movescount and log in. Under Plan & Create, browse to Routes to search and add existing routes or browse to Route Planner to create your own route. Save the route and select the 'Use this route in my…' option. Sync your Suunto Traverse Alpha with Suunto Movescount using Suunto Movescount App (see Syncing with mobile app) or by using Moveslink and the supplied USB cable. Routes are also deleted through Suunto Movescount. Go to www.movescount.com and log in. Under Plan & Create, browse to Route Planner. Under MY ROUTES, click on the route you want to delete and click DELETE. You can navigate a route you have transferred to your Suunto Traverse Alpha from Movescount (see 3.20 Routes) or from a log in your logbook with GPS data. You get a preview of the route based on the route list or logbook selection. If you are using the compass for the first time, you need to calibrate it (see Calibrating compass). 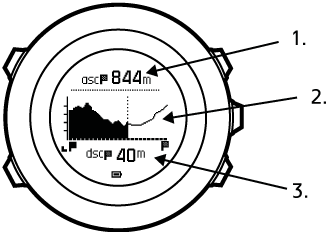 After activating the compass, the watch will begin searching for a GPS signal. 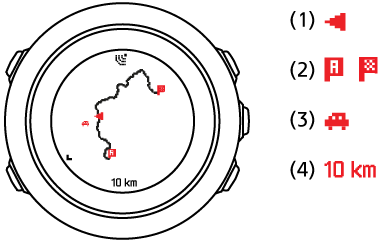 After the watch acquires a GPS signal, you can begin to navigate a route. Scroll to NAVIGATION with START and press NEXT. Scroll to Routes or NAVIGATION and press NEXT to enter . Scroll to the route you want to navigate with START or LIGHT and press NEXT. Press NEXT to select Navigate. All navigating is recorded. If you watch has more than one sport mode, you are prompted to select one. 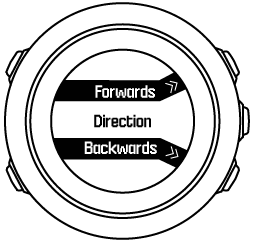 Select Forwards or Backwards to chose the direction you want to navigate (from the first waypoint or the last). Start navigating. The watch informs you when you are approaching the beginning of the route. The watch informs you when you have arrived at your destination. You can also start navigating while recording an activity (see Recording activities). (1) arrow indicating your location and pointing to the direction of your heading. (3) The closest POI is shown as an icon. In the full track view the north is always up. You can change the map orientation in the options menu under NAVIGATION » Settings » Map » Orientation. If you veer too far off the route track, the profile graph is not updated. Instead, the text Off route is shown below the graph. You need to return to the track to get accurate ascent calculations.